Glimmer Spirit Messenger #2 is the second piece in my new body of work. You can read about Glimmer Spirit Messenger #1 here and what prompted this body of work here. Glimmer Spirit Messenger #2 started out similarly to #1; a sketch, a head, and building a core body from 13g wire, aluminum foil, hot glue and masking tape. The face for this piece was modeled after a picture I took of myself. From here the body was constructed using 13g wire folded in half, wrapped with aluminum foil and secured with hot glue. But Glimmer #2 needed a little more support and girth to keep her upright. So I wrapped the body with some masking tape and attached the neck to the head and body. From here, as with Glimmer #1, I add two layers. One from scrap clay and then the outer layer with colored and embellished polymer clay. And here is Glimmer Spirit Messenger #2 all dressed and ready to join her sister. Glimmer Spirit Messenger #2 has a bit of a military look; epaulletes on the shoulders and 9 pairs of seed beads “laced” together with thin strands of polymer clay. 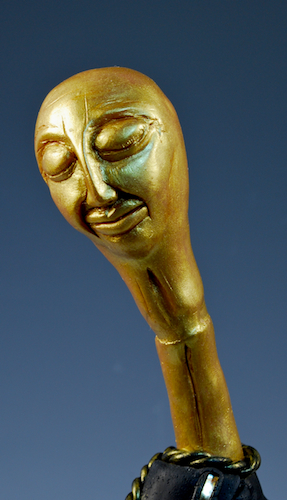 Glimmer Spirit Messenger #2 also has kernels of gold clay at her base. However, she holds a special pearl in the center of the gold. This area is covered with a small piece of netting for protection. Categories: Amy's Art, art, Art Dolls, Creativity, Developing a line of work, Finding a voice, Inspiration, intention, Mixed Media, Polymer Clay, Sculpture, Spirituality, Style | Tags: beads, black, change, Creativity, emotions, fear, Glimmer of Hope, gold, gratitude, health, Inspiration, life, military, Mixed Media, pearls, Polymer clay, Sculpture, Spirit | Permalink. I find myself dabbling more with mixed media techniques these days. My friend Judy and I were emailing about various techniques when I mentioned Copic markers and airbrushing. I had read in one of Linda & Opie O’Brien’s books about airbrushing with Copic markers. Copic markers have been around for a while and are a bit pricey. I spent a bit of money years ago on a couple sets of Prismacolor Markers which were the “go-to” marker for use on polymer clay. I use them once in a while, though not on polymer clay. Most of the time they lay in a pile in a Rubbermaid container on the floor of my studio. So the thought of buying even more expensive markers that I may or may not use wasn’t appealing to me. But the idea of airbrushing with a marker seemed intriguing and has been in the back of my head for a while. Anyways, my dear friend in her mixed media wisdom suggests using one of those cans of air that you use to clean computer keyboards and other tight spots. Ding! Off went the light bulb. I pulled out a sheet of scrap paper, grabbed a bright pink Prismacolor marker from the box, took out the can of compressed air from under the studio sink and proceeded to experiment. And darn if it didn’t work! Now the Copic marker system is a little fancier, with a holder for the marker and can of air that attaches to it. You can even get a kit that attaches to a compressor. But by placing the plastic straw into my can of compressed air and aiming it at the tip of the Prismacolor marker, I was able to achieve some cool splatter and spray marks. The larger splats on the right and left of the page (circled) are the result of spraying the broad tip of the Prisma marker. The smaller blobs (marked with squares) were the result of spraying through the fine tip. Now Copic markers are refillable. I imagine the Prismacolor markers may dry out over time when sprayed excessively with the compressed air. But this little experiment may be fun to use in some mixed media pieces that don’t require a large area to be covered. Next I’ll have to try blending colors. Categories: Amy's Art, Creativity, Favorite stuff, Inspiration, Mixed Media, Opportunity, Style | Tags: airbrushing, art, compressed air, Copic markers, Creativity, experimenting, graffiti, Inspiration, Linda & Opie O'Brien, Mixed Media, Polymer clay, Prismacolor markers | Permalink. I want to create mixed media wall art pieces as part of the Glimmer Series. 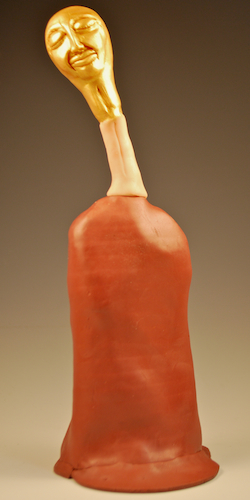 As I started to develop this body of work, I had a strong urge to work with beeswax. Don’t ask me why; I have no idea. But the muse said to give it a go and to see what happens. Ideally I would love to create the mixed media wall pieces on artist panels. I bought a few 4″x4″ panels with a 3/4″ profile last December. Those panels are intended for a different project but they might be incorporated into this body of work. Anyways, before jumping right in and working on the panels, I created a prototype wall piece on 5″x7″ artist canvas panel. This gave me the chance to play with beeswax, papers, oil paint and polymer clay all on one surface. Beyond that, I didn’t plan out the piece with a sketch and just worked intuitively. I started out by applying beeswax to the canvas, placed a page torn from an old book into the wet wax, and then fused more wax on top. From there I built layers with rice paper, paper beads, and oil paint. I fused tiny pieces of branch around two words from the book: “Changed” and “Beautiful”. 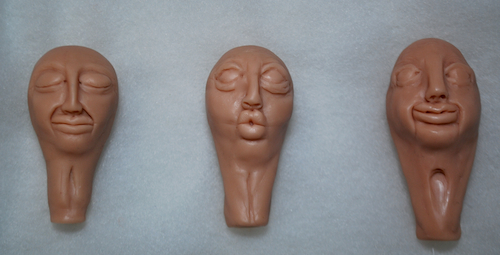 The polymer clay face is taken from a mold made of Glimmer #1’s face and painted gold. When the entire piece was cooled and dry, I highlighted the raised areas with Gilder’s Paste. Gold stamped words “Glimmer” and “Hope” finish this prototype. 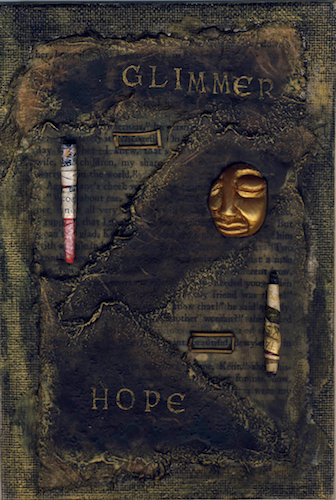 Categories: Amy's Art, art, Collage, Creativity, Developing a line of work, Finding a voice, Inspiration, intention, Intuition, Mixed Media, Polymer Clay, Self-confidence, Spirituality | Tags: art, Beeswax, Books, canvas board, change, Creativity, dreams, emotions, fear, Gilder's Paste, health, intent, Mixed Media, oil paint, paper beads, philosophy, Polymer clay, Spirit, Spirituality | Permalink. Glimmer Spirit Messenger #1 is the first in a series that I am creating as part of a larger body of work. This first part is called Glimmer (of Hope.) The Glimmer series developed out of a series of health issues that I have been dealing with since last November. Specifically, these health issues revolve around that change of life known as perimenopause. 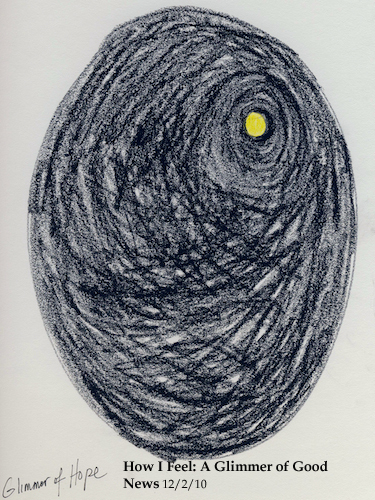 Glimmer Spirit Messenger #1 embodies a time of contemplation, reflection and hope. Below are a series of pictures documenting her creation. Glimmer #1 starts out with a solemn, contemplative face. I have chosen to paint all the heads gold in this series. Echoes of the song “Goldfinger” bounce around in my head as I paint. 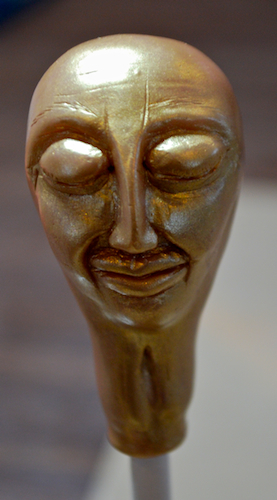 Each head receives two thin washes of gold paint and then a final thicker layer. A wash of burnt sienna acrylic paint completes each head. And then I realized I had a bit of a problem. 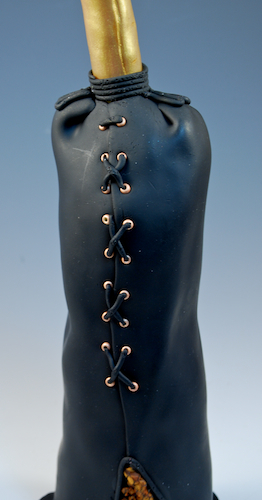 Each piece in this series will have an elongated neck representing my struggle to keep my head above it all. 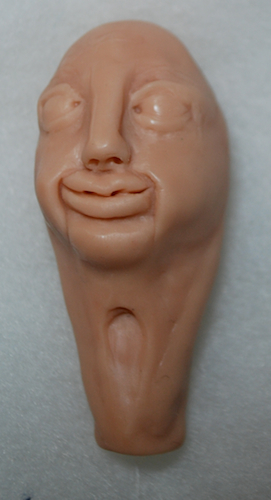 But it didn’t dawn on me to add more clay to create the elongated neck until after I had already painted the head. And matching the raw clay to the now painted cured clay could present a minor challenge. After some measuring and finagling, I constructed the wire core and aluminum foil body and blended the raw clay to the painted gold clay as best as possible. Another issue I often face in body construction is dealing with balance. My Spirit Messengers seem to either lean forward or tilt backward which usually requires some readjustment of the base. In this series, the elongated necks also present an interesting challenge. I often have to bend and adjust the wire support to the right angle before securing the head to the body. However, I am letting these pieces develop naturally. By that I mean, if the head positions itself at a particular angle, I’m quite likely to go with it. All of the Spirit Messengers in this series will have black bodies. I decided to go with black because the “Glimmer of Hope” appeared at what felt like a very dark time for me. It was like a tiny ray of light poking through dark clouds. Each body will have different embellishments. The gold heads and black bodies will connect all of the pieces. 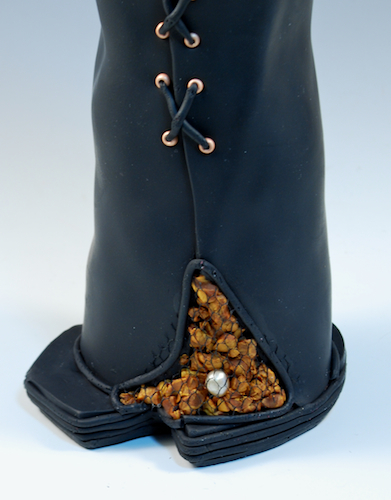 Glimmer #1’s body is embellished with peach colored size 8 seed beads, kernels of gold polymer clay and embossing metal. She has a lightly textured surface. 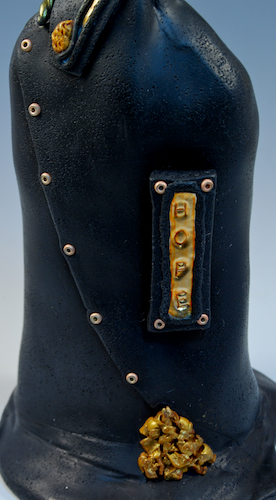 The word “Hope” is stamped into the embossing metal. The metal was tinted with a blend of alcohol inks. 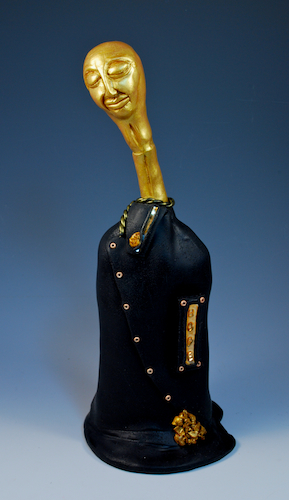 Glimmer Spirit Messenger #1 is 9″ tall and 3.5″ wide at the base. Categories: Amy's Art, art, Art Dolls, Creativity, Developing a line of work, Finding a voice, health, Inspiration, intention, Mixed Media, Opportunity, Philosophy, Sculpture, Spirituality, Style | Tags: art, Art Dolls, beads, black, Creativity, dreams, emotions, fear, Glimmer of Hope, gold, gratitude, health, Inspiration, intent, life, Mixed Media, perimenopause, philosophy, Polymer clay, Sculpture, Spirit, spirit messengers, Spirituality, totems | Permalink. When I was confronted with my health issues late last year, I made a conscious decision to slow down. I also decided to use my artwork as a form of healing. More specifically, I am using my health situation as a muse for my artwork. I introduced this challenge last week in this video. Recent events have caused me to relocate my studio and my creative muse has laid quietly while I deal with more doctor’s visits and tests. However, before all this happened, I started documenting my process in the creation of the Glimmer Series. I prefer to use Super Sculpey over aluminum foil. I’ve learned that this keeps the heads from cracking which is especially important when you work on a larger scale. I knew at least one Glimmer Spirit Messenger would have a solemn face. Instead of searching for faces online for inspiration, I decided to take pictures of myself with different facial expressions. Afterall, this series comes from my emotions, so why not use myself, my expressions, as a model? 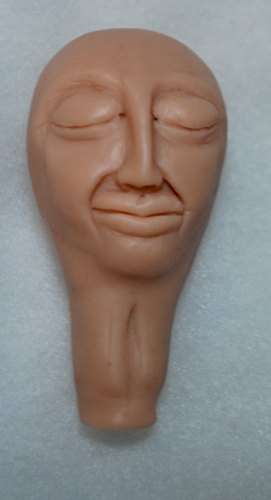 I was pleasantly surprised how my very first solemn face sculpture turned out. 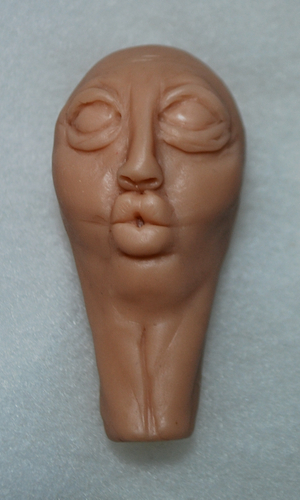 I don’t know if I’ll be able to recreate another face like this again. But that is also why these are one of a kind pieces. 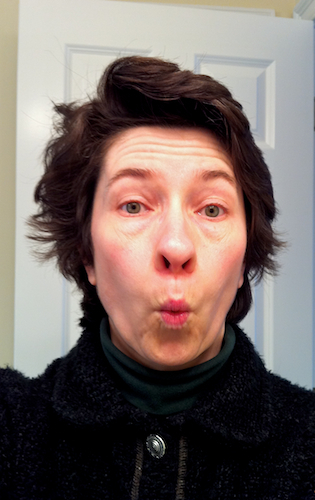 Another face has puckered lips. A face of concentration or frustration or relief. I’m not quite sure which one. Along with the Spirit Messengers, I plan to create mixed media wall art as part of this series. I’d also like to use fabric and perhaps boxes or other forms for the bodies. My goal is to create 6-8 pieces. I’ve completed two Spirit Messengers so far and will introduce them to you in the next few days. Categories: Amy's Art, art, Art Dolls, Creativity, Developing a line of work, Finding a voice, Inspiration, intention, Mixed Media, Opportunity, Philosophy, Sculpture, Self-confidence, Spirituality | Tags: Art Dolls, body of work, Creativity, dreams, emotions, fear, fibroids, goals, health, Illness, Inspiration, intent, life, Mixed Media, perimenopause, philosophy, Polymer clay, Sculpture, Spirit, Spirituality | Permalink. Life is up to her old tricks these days, throwing some curve balls into our rather steady day to day activities. I’ve posted several pictures of all the snow we’ve had recently (here and here.) Last week after back to back storms, the snow and ice took its toll on our house and the ice dams went into overdrive. As we scurried to stop leaks in two rooms, it was decided that I had to drop the temperature in the studio to 55 degrees in order to keep the top of the house as cool as possible. (Guess that means my studio on its own just wasn’t “cool” enough.) It also meant setting up fans in my studio and a dehumidifier to remove moisture from the ice dams that had seeped into the carpet. After a couple of days of clearing snow and ice and putting ice melt socks on the roof (which fell off anyways), I decided that I was going to have to relocate my studio for the near future. The process of returning the studio to its normal state is going to take some time and I, sadly, cannot work there in its current condition. A friend told me it looked like a cover for a “screamo” band. Well, if I can’t make my art in my studio, perhaps I have an alternate career as a screamo band face model. Moving out of my studio has not been easy. The studio is my sanctuary. It has an energy all its own and in there I can lose myself. Now I was faced with deciding what to bring to my new location. Not an easy task when you’re used to having all your art supplies right at your fingertips. 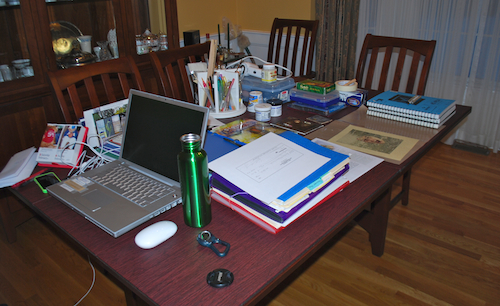 After a bit of avoidance, I relocated to our dining room. 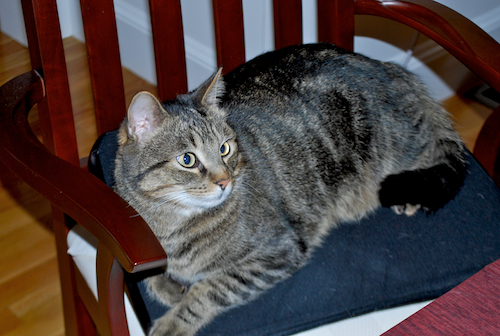 Eric helped me set up a small table and my work chair. 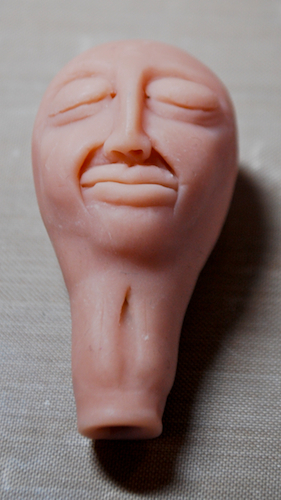 I decided not to bring down all my polymer clay. Instead, I’ll bring down what I need as I work on each project. That alone will be an interesting challenge. 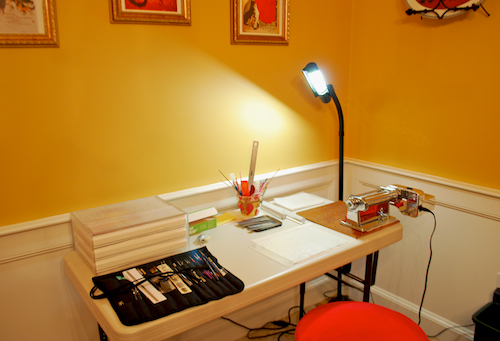 I also brought down my sketchbooks, paintbrush carousel, my sculpting tools, some pastels, and a few other tools. My laptop and a few business items round out my new temporary space. The cats are enjoying my new set up. They like to jump on the dining room table and peer at me over the edge of my laptop. Woody has also enjoyed playing on the rug under the work table. I admit there are advantages to this new location. It is closer to the bathroom and the kitchen! As I write this, the leaks have stopped and the carpet in the studio is almost dry. Of course another project remains and that is repair and repainting. I’m not sure when I will move back into my studio. 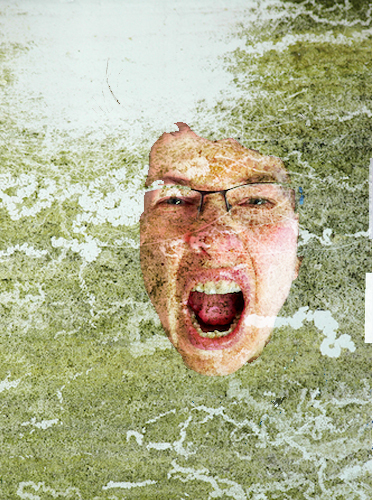 The stress of the ice dams, leaks, and moving my studio has been compounded by my continuing health issues. Plan A, which included a trial on a pill to reset my hormones, has not worked as hoped. Today I had a pelvic MRI, with and without contrast. A pelvic MRI will give an even better look at the fibroids and their location, how many I may really have, and the blood source. Based on the results of the MRI, I am looking at two options, one more favorable than the other. Both of which would bring resolution to the problem. The MRI itself wasn’t too bad. My first MRI was in 2009 for my back. That was in an older machine and I had to go in head first. For this test, I went to a different location and went into the tube feet first. They placed a foam like grid over my belly/pelvic area. Because I was also having this test done with contrast, an IV was placed in my left arm. When the first procedure was complete, they rolled me out of the MRI tube, hooked up the contrast, I raised my arms over my head, and back in I went. That was the shorter of the two procedures. I should get the results on Monday and things could move rather quickly after that. I’m making peace with this situation, with my options, and what may lie ahead. It is not easy to give up control over your body and harder still to lay the burden at the hands or feet of something larger than us. I know I am on the road to a solution. Soon a plan will be in place. Categories: Amy's Art, Balance, health, Humor, intention, Nature, Philosophy, Self-confidence, Spirituality | Tags: Cats, change, dreams, emotions, fear, fibroids, God, gratitude, health, Humor, ice dams, intent, leaks, life, MRI, Nature, philosophy, snow, Spirit, Spirituality, time, universe | Permalink. The word I’ve chosen to guide me in 2011 is the word BIG. So, why did it take me so long to post it to my blog? Because I’ve been working on BIG things. That and well, I wasn’t quite sure what to write about the word I chose. As 2010 drew to a close and I was dealing with my health issues, I started having very vivid dreams. In one dream, a man spoke of his rebirth as if he were a prophet. That dream stuck with me and I contemplated choosing rebirth or renewal as my words for 2011. And then I read Lisa Call’s blog post on how she chose her word for 2011 and how she distinguished between “doing” words and “being” words. That made me think. Is the word I choose for 2011 going to be a “doing” word or a “being” word? The words “rebirth” and “renewal” sounded nice but on some level they weren’t quite clicking with me. They seemed too, um, airy-fairy. And then the word BIG popped in my head. Two of my Spirit Messengers were featured on Barb Kobe’s blog. I was asked by Artella if they could reprint my drawer knob tutorial in their e-zine The Art Journal Journey. A tip I submitted on beating the entrepreneur lonelies was included in Sara Shaw’s Entreprenette Gazette. I posted my first video. I received word that photos of my Right Brain Business Plan have been included in Jennifer Lee’s upcoming book The Right Brain Business Plan: A Creative Visual Map for Success. My iron levels returned to normal which means I’m no longer anemic. If the last few weeks are any indication, the word BIG is already guiding me and having a positive influence. So BIG has become my word of the year. I guess it is both a “doing” word and a “being” word. I want to do BIG things. I want to be BIG and live fully. Who knows; maybe BIG will also bring renewal and rebirth with it. Categories: Balance, Creativity, intention, Intuition, Opportunity, Philosophy, Spirituality | Tags: big, dreams, emotions, fear, goals, guidance, intent, Intuition, life, philosophy, rebirth, renewal, Spirit, Word of the Year | Permalink.